1965, outside Union Station in Seattle. There's a new UW study that re-calibrates the effects of a magnitude 7.0 earthquake on the Greater Seattle region, including impacts from landslides.The Seattle Times did a front page story on the findings this morning, and at the same time re-published its excellent guide to disaster preparedness that we saw earlier this year. While you're buying presents for others, how about one for your family and your house? Use the guide (or my book) to gather a list of supplies for a disaster kit. Or stop by Costco or Target or other big stores and pick up one of their pre-prepared kits, usually found in either a large plastic drum or a backpack. Then stick it under the tree with a big bow on it, and cross that particular task off your "to do" list. If you've already got such a kit, then create or update your family emergency plan: where will you all meet if you can't get home? who will you call to let the rest of the family know where you are and that you are ok? what city resources should each of you know about? finally, what is the plan if phones don't work? Here's a link to a terrific story in The Street this morning, on the risks that folks run in conducting business transactions (like online banking) over unsecured public wireless platforms. It seems especially appropriate on the day we call Cyber Monday. 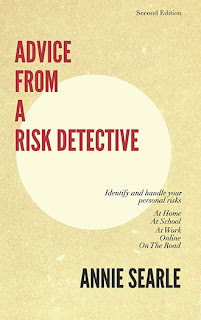 In the chapter called "Online" in Advice From A Risk Detective, I talk more about how to secure your online work, including some of the products that I've found useful to protect against malware and viruses. Later this week, I'll be talking about securing your home -- and packages that might be arriving -- over the holiday season. It's time to review the traditions and practices that have become so comfortable, to ensure that you're minimizing your risk both at home and online. To the left is a comfortable practice that goes back 30+ years: picking up holiday trimmings at the Hunter Tree Farm tree lot in neighboring Wedgwood. What could make that tradition even more safe?